First Prog: (as art editor): 175 – as far as I can tell; he may have been on staff earlier. Final Prog: (as art editor): 554 – or thereabouts; he may have stepped down earlier. (as artist): 1872 – and I wouldn’t be surprised to see his work again occasionally, in the Prog or Meg. -including his run on The Bogie Man for the Megazine, but not his run on the same character for Toxic and elsewhere. Also including not just his front covers, but his various Star Scans, and this curio from 1986, the Mega-City Primer, which ran on the back of Progs 501-514ish. Sadly I don't know who wrote the text - maybe Smith himself? That's an awesome rendering of Rico Dredd right there. If you want to see the whole thing, go buy some back Progs! Forbes Clunie, aka the Bogie Man. I don’t like the Bogie Man (the series) as much as creator John Wagner does, but the character is a fine creation, and absolutely at his best when drawn by Smith, who really nails the look of a man who is ordinary, a bit ugly, and believably both clueless yet cool. A major part of Smith’s job was to re-draw various bits for the Prog for any number of reasons, which was served by his facility with mimicking the necessary style. There’s a reason he was called upon to concoct character montages for the covers of annuals and such – he can make any character look right, while some other artists may get a bit lost trying to render someone drawn in a distinctively different style. I also gather that he had a strong hand in cover designs. I've not idea which specific covers he laid out (Hmm, if only there were an online resource one could go to to find out about 2000AD covers...), but here's a small selection of covers designed and drawn by the man himself. I still miss this classic chunky logo. Did Robin Smith have a hand in its creation? Mark Buckingham's legendary Spider-Man villain, Typeface? For me, and I really do want this to sound like a compliment, there’s something very straightforward about Smith’s drawing – it felt like something I could have a go at and end up with a professional-looking result. 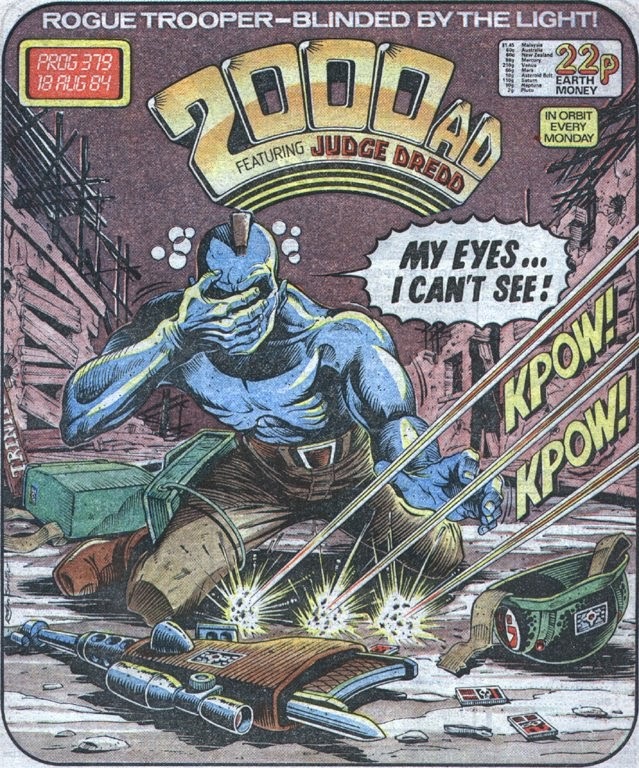 (In fact I'm pretty sure I did copy one of his Rogue Trooper panels for an art project at school once) I also think he’s one of the best at designing characters who feel not just ordinary, but actively downtrodden, ugly and generally a bit rubbish, without going over the top with it. Much harder to do than designing chiselled heroes, outlandish villains and indeed loopy-looking weirdoes. Smith features fairly heavily in parts of Thrill-Power Overload, and seems to have been a well-liked and deeply reliable member of Tharg’s droid dept. 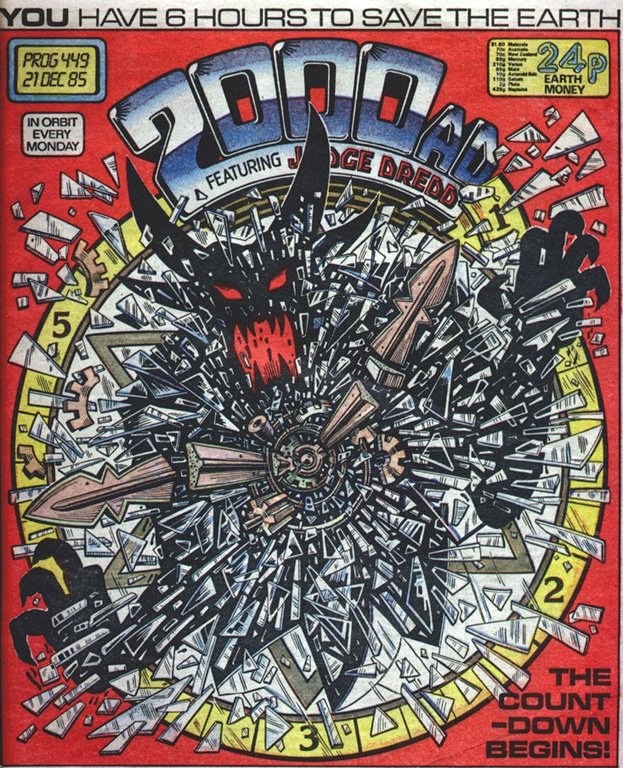 Presumably his position as art editor is why he didn’t have much time to do more strip work, but he still managed to stamp a personal legacy on the comic through a host of covers and peripheral artwork – not least a memorable series of pin-ups featuring various creators in their droid incarnations. But we shouldn’t discount his actual strip work, as featured in the odd Judge Dredd episode but also across two full series, Bad City Blue and The Bogie Man. I’ve touched on his Bogie Man work above. Bad City Blue was a very different beast – pretty much the comics embodiment of a straight-to-video 1980s action movie, with the star who was sort of but not quite a big name – like Eric Roberts or Robert Z’Dar, someone like that. There was snarling, there was fighting, there was run-down urban set dressing, and there was proper panel-to-panel storytelling. 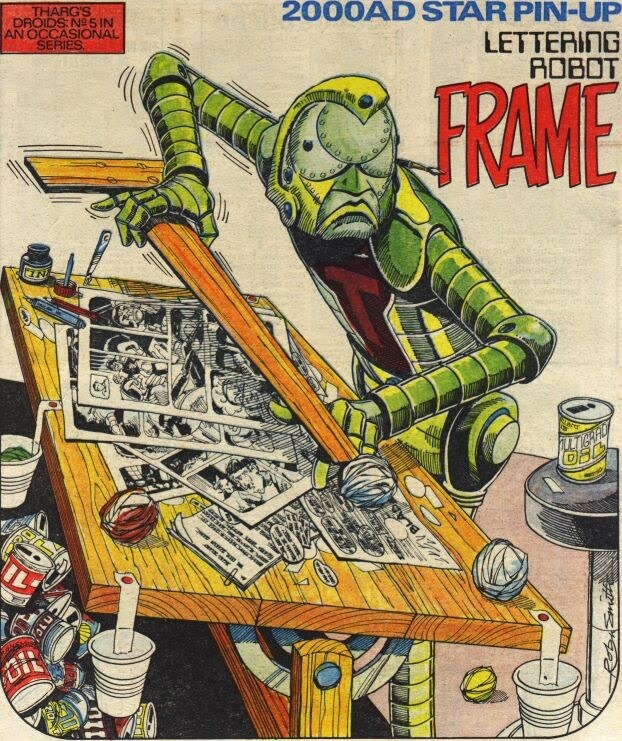 To me, Smith’s style falls between the old-school British comics work of the 60s and 70s and the new, hard-edged and basically weird mix of styles embodied by 2000ADs first wave of art droids. 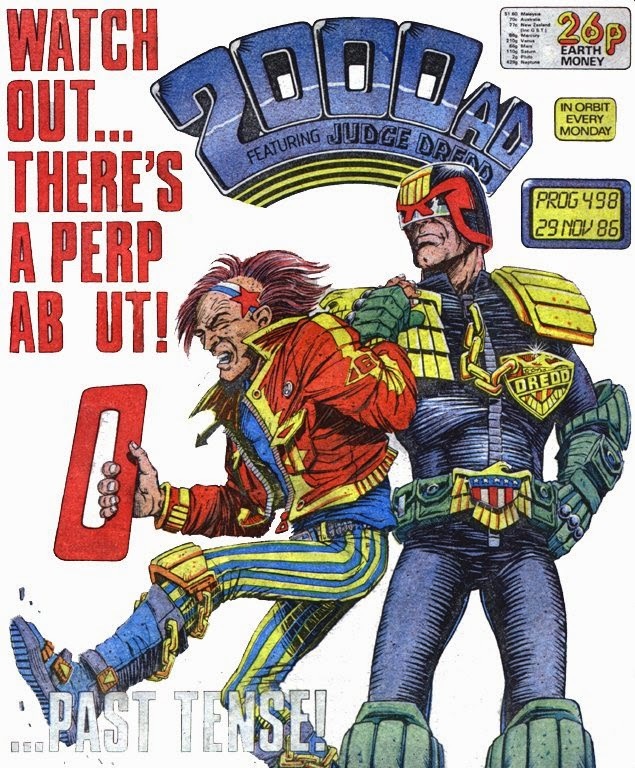 As a result, his work at the time perhaps got a little lost amongst the flash and bombast of, a Brendan McCarthy, or the chunky action-fest of a Carlos Ezquerra. But there’s a lot to love – go check out some Robin Smith comics, and revel in the studied eccentricities of his characters’ facial expressions. Smith has, and likely still has, a strong connection to the house of Tharg, so much so that he was asked to write, draw and letter (something a tiny handful of other droids have managed!) 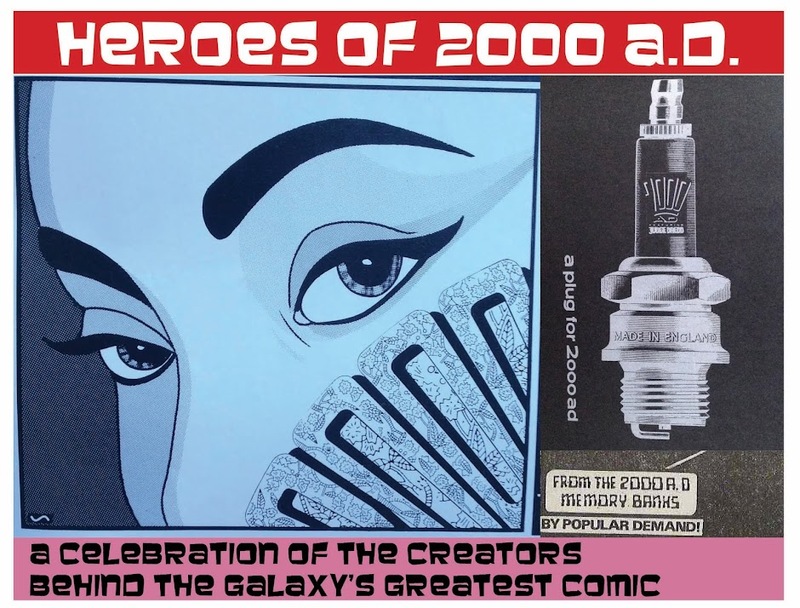 his own 5-page story, the History of 2000AD published in 30th Anniversary Prog 1526*. 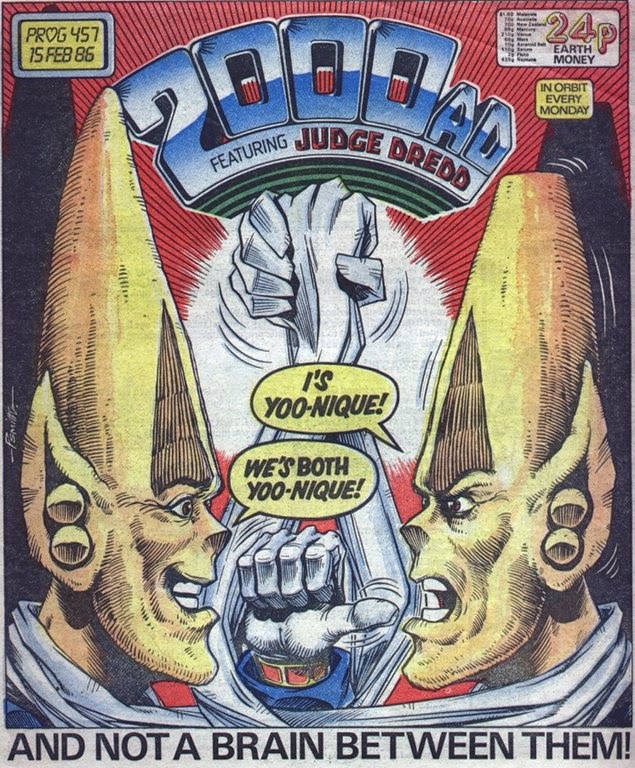 that Pat Mills created before unleashing DiceMan on the world. You can see a full set of his Droid pin-ups over at Barney. Otherwise the only place I can find an interview with the man himself is in print, across Megs 225-226. *which seems like only yesterday but was, somehow, 8 years ago!